Well-connected in academia, business and government, John Maynard Keynes was one of the most influential economic theorists of the twentieth century. It appears that his theories will be just as important for the twenty-first. As Keynes himself explained, his ideas throughout his life were influenced by the moral philosophy he learned as an undergraduate. Nevertheless, the meaning and significance for Keynes of this early philosophy have remained largely unexplored. 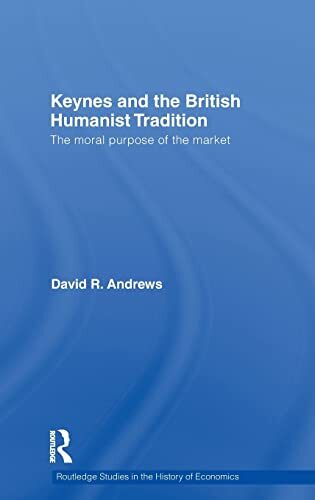 Keynes and the British Humanist Tradition offers an interpretation of Keynes’s early philosophy and its implications for his later thought. It approaches that philosophy from the perspective of the nineteenth century intellectual context out of which it emerged. The book argues that roots of Keynes’s early beliefs are to be found in the traditions of the Apostles, the very famous secret society to which he and most of his teachers belonged. The principles of Keynes’s philosophy can be seen in such writers as John Stuart Mill and Henry Sidgwick, but the underlying ideas have been obscured by changing fashions in philosophy and thus require excavation and reconstruction. This book will be of interest to students and researchers in the history of economics, in particular the thought of John Maynard Keynes, especially his ethics, politics and economics. David Andrews is currently Visiting Associate Professor at the University of Richmond and Associate Professor, State University of New York at Oswego, USA.